1. Visit San Miguel: It is the main city of Cozumel, and depending on where your cruise ship is docked (Cozumel cruise port pier location varies depending on many factors including point of origin) is typically about a ten minute journey from the pier to the bustling and lively city of San Miguel. Serving as the center of the surrounding community, San Miguel is an excellent place to pick up some local souvenirs, admire the clock tower and perhaps catch a performance from a live local band. For those shopping in San Miguel, it is important to remember that whether you are buying local artwork or a hammock, some city shop owners can be pushy and aggressive. It is best to leave any store that does not provide friendly service as there are so many to choose from. 2. Beachside Walk: Many things to do in Cozumel rely solely on the natural beauty of the area, and a seaside stroll along the seawall promenade is just one of those things. Known as El Malecon, the breezy and beautiful edge of the Western part of town affords visitors who do not want to stray far from their ship and the Cozumel cruise port an opportunity to indulge in the spectacular views and environment surrounding them while they can also enjoy watching the activity from the ports. There are also many Mayan replicas to enjoy along this stretch, as well as some statues erected to pay homage to heroes of the region. If walking is not your thing, hitch a ride on a calandria (horse drawn carriage) instead. 3. Visit the Local Fresh Market: It has been said that in order to truly experience a location’s culture, you must experience their food. And while we will get to prepared local Mexican cuisine later, there is something to be said for visiting the local market first. Native fruits and vegetables are easily obtainable at the local market, situated next to the city center of San Miguel, and visitors can enjoy the local customs and culture as well as sample fresh, native produce, meats, spices and fish here as well. Those tired of cruise ship food will do well to venture a short distance away from the Cozumel cruise port to the market to see what is in season and do some sampling. 4. Iglesia de San Miguel: A few blocks from the northernmost pier can be found the main church of Cozumel, Iglesia de San Miguel. It boasts a sword wielding ivory statue of St Michael the archangel, a purported gift to the island’s Catholics from farmers who found it a century ago. The church itself is incredibly impressive, featuring copper toned tower peaks and intricate architectural details. It is absolutely worth a walk from the Cozumel cruise port to see, and a not-to-miss for first time visitors to the area. 5. 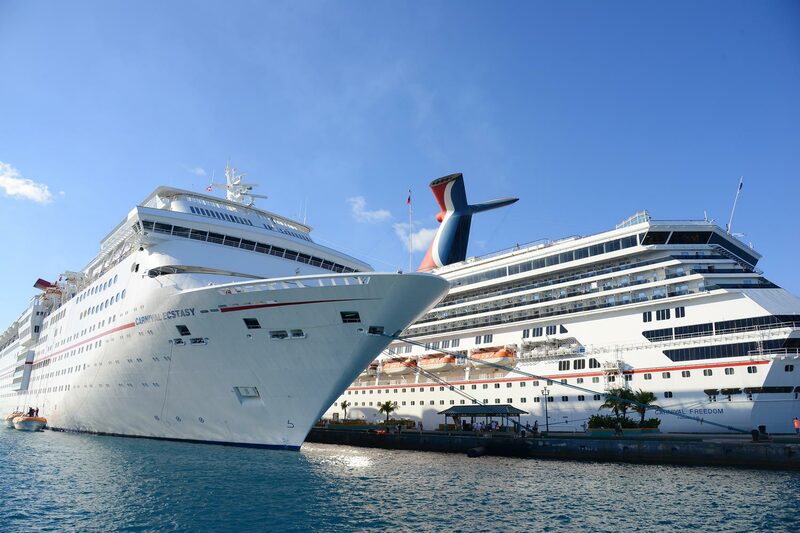 Enjoy Local Cuisine (and booze): One of the best parts of Western Caribbean cruises is that while the ships tend to feed passengers well, they do not offer the tastes of the region. Port destinations provide an immense array of local dining opportunities (and, drinking opportunities as well). San Miguel does have some well known and familiar eateries like the Hard Rock Café, but guests will do well to use their port time to experience true local fare. Pancho’s Backyard provides both, including Mayan influenced local specialties and margaritas that are top notch. The area even boasts an Italian restaurant, Guido’s, which may be well suited for pickier eaters. But, for a condensed experience from a decades old mainstay, Cozumel cruise port guests may want to check out Casa Denis, which provides local history, a cultural atmosphere and traditional food options. 6. Resort Day Visits: Unfortunately, you can not simply step off your ship and hit sandy beaches in Cozumel. However, that does not mean that you have to hang around the Cozumel cruise port area either. A short taxi cab ride away is an abundance of resorts that cater to one day visitors who are ported at the piers. They typically charge a flat all inclusive fee for guests that averages around fifty dollars. Visitors to the resort parks can enjoy water sports, snorkeling, glass bottom boat rides and gorgeous and pristine beaches. In fact, some of the best beach vacations are just a hop skip and a jump away from the busy pier area of Cozumel. 7. Mayan Ruins: For many, seeing the ruins of the ancient Mayan people is an absolute highlight during their time in Cozumel, and the island features many opportunities to observe this ancient history. Some of the Cozumel excursions featuring Mayan ruins can be very lengthily (between seven and ten hours) and this pay pose a problem for guests with a deadline to return to the Cozumel cruise ship port. Careful planning is thus required to visit the ruins of Tulum, and a quicker trip to the ruins of San Gervasio may be more feasible to visitors coming from cruises to Cozumel. Although smaller than the more impressive ruins, there are several ancient arches and some stone structures at San Gervasio that provide a glimpse into the once great empire that stood there. And, Cozumel cruise port guests can also experience some of the local flora and fauna, mixed in with the historical ruins. 8. Museums: Educational tours are not typically the highlight of Western Caribbean cruises, however anyone interested in the local culture and history of the areas that they are visiting should not miss out on these opportunities to further their insight. Cozumel features a handful of museums, including the Museo de la Isla that is a mere couple of blocks from the busy Cozumel cruise port. It features local photographs, exhibits, artwork, crafts and murals that give life to the people and history of the area. Emphasis on the Spanish and pirate conquests round out the exciting displays, and a second story eatery is a great place to grab a snack after gobbling up some knowledge. 9. Submarine Rides: For some people, the thought of getting into another watery device after just stepping off of a huge one seems silly. However, submarine tours provide an excellent way to get up close and personal with the incredibly diverse array of underwater species that inhabit the area around Cozumel. They are also ideal in length for those with limited time away from the Cozumel cruise port, lasting around seventy-five minutes in total. Those untrained in Scuba and not in the mood to snorkel will appreciate the underwater view from the dry inside sub. Knowledgeable narration and an air conditioned viewing chamber make hundred foot deep submarine excursions an opportunity not to miss! 10. Dolphin Experience: One benefit to Mexico cruises is that ships pass through waters filled with wildlife that many are not able to experience in their day to day lives. Dolphins flock to the waters around Cozumel and are incredibly social, regularly taking the opportunity to show off. Traveling to Chankanaab Park gives way to a half hour dolphin snorkeling tour that boasts great dolphin trainers and guides. Children age six and over are welcome, and the entire experience including travel lasts about three hours, making it an ideal activity while away from the Cozumel cruise port.